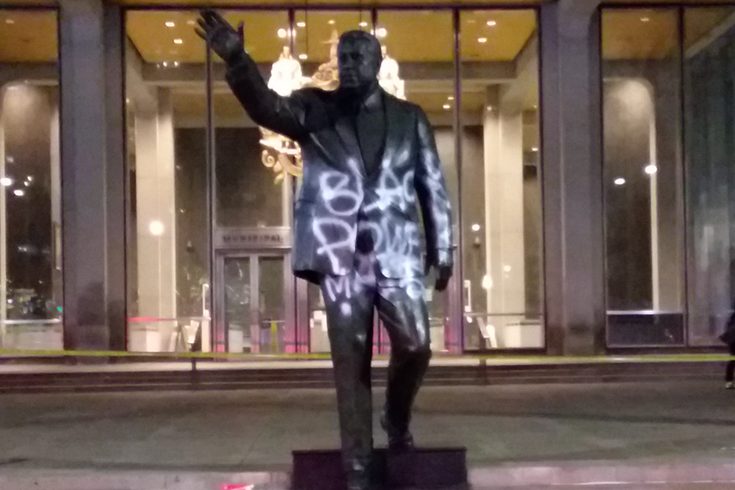 The statue of former Philadelphia Mayor Frank Rizzo was spray-painted with the phrase "black power" during the night of Thursday, Aug. 17, 2017. Philadelphia Mayor Jim Kenney he will ask the city's Art Commission to decide whether to keep the Frank Rizzo statue on display across from City Hall. "By law or by custom, it has to be an administrative-led request to the art commission for them to conduct a hearing on the pros or cons of the piece — whether the piece is being planned or being installed or removed," the mayor said in a Newsworks.org report on Tuesday. "They actually have to vote on it after a public hearing." Controversy over the city-owned monument outside of the Municipal Services Building sprang up again last week after the deadly clash between a white nationalist rally and counter-protesters in Charlottesville, Virginia, earlier this month. Councilwoman Helen Gym responded to the violence by calling for city officials to take the Rizzo statue down last Monday night. In the week that followed, there have been more protests and the statue has been vandalized. A petition to keep the statue also has circulated around the internet at the same time. About 23,900 people have signed it online. Kenney reportedly said Tuesday he opposed the city's decision to erect the statue in 1998. Last week, a spokeswoman for the mayor said "now is the right time" to talk about taking it down. Opponents of the 9-foot-high bronze monument say it symbolizes police discrimination and brutality against people of color and the LGBT community. Those who want to keep the statue argue Rizzo actually worked to change the culture within the city’s police department during his tenure as commissioner, and then as mayor.